The Dow Jones Transportation index has been warning us: by August 25, it was down 19% year-to-date before bouncing. It’s now off 13%. Not all is well in the transportation sector – and by extension in the global economy. The World Trade Monitor, when I last wrote about it on July 22, painted a very un-rosy picture of global trade by having dropped the most since the Financial Crisis. In granular detail, the weekly China Containerized Freight Index (CCFI) fell to 820.91 on Friday, hobbling along near its multiyear low set in June. It tracks contractual rates and spot rates for shipping containers from major Chinese ports to major ports around the world. It’s 22% below where it was in February and 18% below where it had been in 1998, when it was set at 1,000! Spot rates from Shanghai to the US West Coast per 40-foot container equivalent unit (FEU) are down 33.4% from a year ago, according to the Shanghai Containerized Freight Index (SCFI); spot rates from Shanghai to the US East Coast are down 41%.The Drewry Container Freight spot rate from Hong Kong to Los Angeles is down 38%. That’s the east-bound trade, where rates had been collapsing all year. Westbound rates had been holding up. For example, rates from Rotterdam to Shanghai, which tracks the cost of shipping exports from Europe to China, as measured by the weekly World Container Index (WCI), had been hanging in there all year, even if at relatively low levels ranging from $750 to $870 per FEU, according to JOC’s market data. But after August 20, when it still stood at $869 per FEU, it started plunging. By September 10, it hit $611, down 30% in three weeks. The beaten-down shipping rates are the result of an oversupply of container ships and weak global demand for manufactured goods. 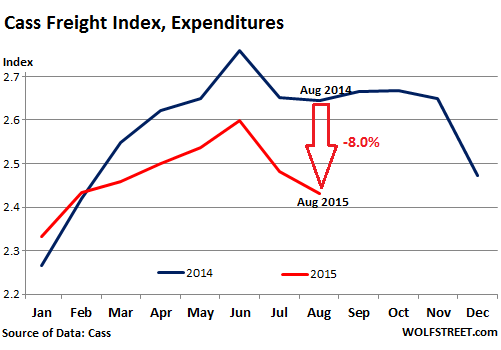 Global air freight has also gotten hit, with traffic down 0.7% in July from a year ago, according to the International Air Transport Association, even as air cargo capacity jumped 6.7%. “The disappointing July freight performance is symptomatic of a broader slowdown in economic growth,” IATA Director General Tony Tyler pointed out in the report. And the consequences are beginning to cascade through the industry: The Wall Street Journal reported that Nippon Cargo Airlines, Japan’s biggest cargo carrier, canceled an order for four 747-8F freighters from Boeing. So trade is not exactly the picture of a thriving global economy. Conditions, instead of getting better, are getting worse. The underlying theme: yes, global trade is in trouble and the global economy is getting mired down, and yes, neither QE nor ZIRP can do anything about it because they’ve been deployed all along for years, and this is happening despite or because of them … but at least the US economy is picking up speed, it is the cleanest dirty shirt out there. And US GDP growth for the second quarter confirmed that. That’s been the underlying theme. 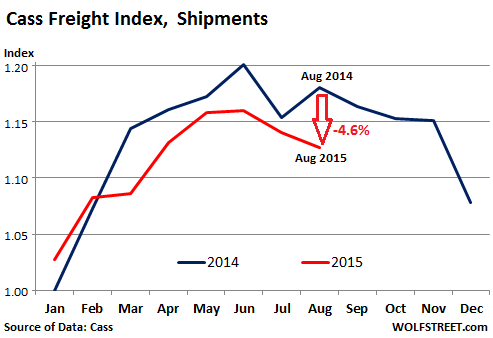 But now the Cass Freight Index for North American is raining on this theme. Generally, retailers are stocking up for fall sales, but high inventories and a rising inventory to sales ratio slowed ordering earlier this year. Inventory levels – for retail, wholesale and manufacturing – are well above the high point prior to the inventory drawdown at the beginning of the Great Recession. Inventories have been climbing during a period of low inventory carrying costs. Interest rates have been the lowest in recent history, warehouse space was abundant and lease rates low, and taxes and insurance costs were flat. Sooner or later, businesses will try to whittle down their inventories, either by selling more or by cutting orders – and the first just isn’t happening to the extent needed. Alas, as the electronic ink was drying on the Cass report Friday morning, the University of Michigan Consumer Sentiment index was released. And it dropped 6.2 points to 85.7, the lowest level since September last year, far below forecast, and the largest drop since September 2013. This trend in consumer confidence has already shown up in other measures as well [read… Market Rout Hammers Economic Confidence of Americans ]. The swoon knocks the foundation out from under the theory that higher consumer confidence would finally drive Americans to splurge and generate more orders and more shipping volume. That hope has been out there, and companies counted on it, but it just isn’t happening. ← Is Brazil About to Drag Down Spain’s Biggest Bank? The proof that Americans are buying Made in America goods again like I phones, I pads, I watches, I pens and GE, HP, MSFT , etc etc. Also the steep drop in freight shipping is partly do to the high demand in Amazon drone “style” delivery services of food and other consumer related products. LOL, you’re stretching Wolf. Good piece in general though. Yeah, thanks. I didn’t say this right. It’s fixed now. It nearly matched Aug 2013 and both were the lowest since 2010. The U.S. is not about to go into a recession. Note that foreign economic problems have never caused U.S. recessions before. China doesn’t even impact the U.S. that much. Maybe I’m just one of the little people, but my town is in recession. It’s a tourist community. We have hotels in foreclosure and 25% vacancy rates. My own small business lost all the West TX revenues from the last 5 years. Fracking fallout, it seems to me. No one says much, but the working people say it’s really hard to make a living. No recession? It’s a depression for many of the people I know, including artists, realtors, shop keepers and building trades. Glad to hear so many of the investor class is doing just fine…..that’s the whole problem now. The money people are doing fine, but those of us who actually make things and culture happen are all devastatingly broke. Wow. that has to be the most misguided comment I’ve ever read here. You’re either a troll or smoking some serious hopium! Troll??? Ha, not this poster. I’m a two part-time job person with a small arts business. Live in NM. Things aren’t fat here for the creatives. I almost lost my house; was “insolvent” in 2014 tax filing. That never happens to trolls, who get paid for posting. I’m very attuned to spending flows due to my small businesses. It’s all real for me…no bunker waiting. I don’t think anyone would confuse you with a troll. Welcome to WOLF STREET’s commentariat, BTW. Tony, everything you wrote is a joke, right. Yeah, right. And we have 5.1% unemployment in the US. Yeah, right. Hopium, AKA consumer “confidence,” is not a particularly good economic strategy when 90% of American households are tapped out. Most folks in this country are drowning under the weight of their existing debts. Half of Americans probably couldn’t come up with $500 in the event of an emergency. They couldn’t borrow more money for splurges or spending sprees even if they wanted to do so. Plenty of cheap Chinese-made plastic trinkets are sitting on Walmart’s shelves for a lot longer than they used to. Walmart doesn’t need to reorder this stuff right now and might not need to for quite awhile. Even the dollar stores have a surfeit of cheap stuff sitting on the shelves at half or less of Walmart’s price. So the dollar stores might not be reordering their assortments of Chinese-made trinkets any time soon either. Not having $500 saved? That would be me….and many of my friends. I have a BA and have worked in 4 industries, all crashed now. A $6K credit card line, which I don’t dare use. A little coinage. Broke. Over 60. Strong work ethic….two part time jobs and looking for another. By the way, I was raised upper middle class, but I didn’t get into the health, legal or education fields. Last job interview they told me that 30 hours is considered full time now. Hello, out there, no recession? Red Flag, I remember hearing a few years ago that the GenYers were worried that their kids would be the first generation since WWII to not do as well or better than their parents. I think the reality is that a lot of the middle class, regardless of age, are not going to do as well as the WWII generation plain and simple. I am over 60 and my wife and I together, with no children, have done slightly better than our parents. But not nearly as well as we should have, given our levels of education and the supposed prestige of the careers we had. Not surprised a lot of folks are thinking twice about spending. If this isn’t that rainy day we were warned about, it is certainly close to it. Same here in the UK. Most of the available income is low waged at the moment until it gets automated, even so the government must back up waged income with enough money to pay rents etc. They keep saying that technology and automating practices which cannot be stopped will produce more jobs but we are not seeing this happen. Most “jobs” being created are tax exemption vehicles where the very wealthy receive a tax exemption for opening up a useless pointless coffee shop or some such entity (as long as it purports to employ) with very little custom base and low wages. Lots of “non-jobs”. We are heading towards a leisure society where we will not have waged income available to most ordinary folks. Governments everywhere surely need to wake up to their currency issuing true identity and ensure that the next domino does not fall which is business production that always needs a real consumer. Exactly….fake businesses everywhere. We see them all over our chic resort town. We have a little mall here with 12 small businesses that has been sold & will be converted to, guess what, an art school. In a town with two colleges with art departments. More shell games. Can’t wait for the correction. Me, I never have shopped in a Walmart. I don’t think Tony is a troll, as his handle clearly identifies where he’s coming from. He may be new to the Street although I’ve been busy lately and took a hiatus dealing with my truck being taken out when another driver dragged his trailer across my hood leaving the truckstop in CT. My company has been keeping me busy although the deadhead miles seem to be getting longer. I expected Labor Day Weekend to be more like normal but all weekend I didn’t see one boat trailer or Marvin in his Motorhome. People were out but not any busier than a normal workday. Tony may be a bit myopic if he is not getting out much, he may be suffering from the normalcy bias that everything will be better tomorrow. If so he’ll be badly mauled in the crash, and he’s late to the party. The 4Gs Tony: gold, guns, ground and grub; at least make an effort. Hold some cash outside the banking system. If it feels less threatening to you tell yourself it’s for a natural disaster or a systemwide computer crash, or buying opportunities if stocks drop, fine. JUST DO IT. Recession? What recession? Since graduation in 1969 I just could never understand the “value” of higher education, as there was never any “security” in ANY of the jobs they were touting. So, this idiot went into the Transportation game. Railroads, trucking companies, finally working for the FED in their transportation area. Retired now, with a nice investment portfolio, and no debt. So, WHAT jobs are always being advertised? Truck Drivers, you got it, and dispatchers, traffic managers, oh sorry logistics coordinators these days. No, you will not earn huge money, but you will earn enough, then you invest a portion, keep at it for 35 years, then we can talk again. Over 60 and broke? Hmmm, must be the student debt, right?